Rangers folded on Monday after failing to attract local players, dwindling player commitment and the cost of travelling around the league. As expenses get higher, and volunteers willing to give up their Saturdays get fewer, Di Paola believes that Sussex football must be streamlined to avoid a repeat of the St Francis Rangers situation. Di Paola said: "If it was me, I'd get rid of Division 2. I'd release all those clubs back into what you'd call parks football because then all of a sudden you have these players that don't want to play district football and they'll want to play for some of the other clubs around. "It's great that clubs have ambition but it's killing long-standing clubs that haven't got budgets or benefactors. "Teams like Alfold have come up through the ranks, and it's not just them there's loads of them. There are loads of teams in the same area. "We have the same issue. There are probably too many teams at step 3 and 4 in Sussex. We have to fight with Lewes and Worthing for every player. "All the best players that come out of the County League are now playing for Haywards Heath, East Grinstead, Three Bridges, or us, whereas before they'd be playing in the County League because there wouldn't be as many step 3 or 4 teams. "The issue with the pyramid in Sussex is a problem and it's a shame for St Francis but I think there will be a few more that fold. "St Francis were always a nice and friendly little club. They had a group of ten local boys but they all moved on and the club just couldn't replace them with anything so they had an upwards battle all the time." Three teams were added to Division 2 for the 2018/19 as the football pyramid was readjusted. Angmering Seniors, Brighton Electricity, and Copthorne were all promoted up from step 12 and Di Paola feels that these clubs should have to meet the requirements to gain promotion to Division 1. The Horsham boss added: "Clubs should prove that they've got ambition because you see a lot of clubs get promoted and then they can't get out of the County League 1 or 2 as they haven't got the ground grading. "You look at Rustington. They couldn't go up last year after they won Division 2 so it's those sorts of things. "No disrespect to Rustington but they can't go up but they've got a group of boys there that are good and local and will probably win it again this year." St Francis Rangers weren't the only team across the Southern Combination Football League to be unable to fulfill their fixture. Midhurst & Easebourne were unable to raise a team for their Division 1 away game against Hailsham Town, while Division 2 Cowfold couldn't field a side for their home tie in the SCFA Intermediate Cup against Upper Beeding. 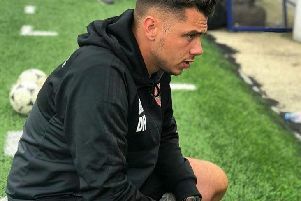 Di Paola feels that the attitude of players has changed since he was playing, and questioned whether or not football in the lower reaches of the pyramid could continue. He said: "Players aren't as committed now. I see a lot of younger lads now that don't want to waste their whole Saturdays so they play five-a-side football on the 3Gs midweek. "They still get their football but they don't have to give up their Saturdays. It is a huge commitment and I think a lot of younger people have got a lot of other things they'd rather be doing. "When I used to play, I'd never miss a game and I'd never go away during the season. I'd plan to go away in the summer but nowadays people want to go away and do more things. Maybe it's dying?"